When you want desk organization, this desk storage set delivers. This three piece set offers classic design style and a chic way to store and organize all your important office items. With a beautiful antique brass gold finish and modern design, this desk set offers function and style. Organize Supplies and Files Easily with the Blu Monaco 3 Piece Desk Set. DESKTOP FILE ORGANIZER 3 PIECE SET: There's no need for an elaborate set, this office desk organizer set is an ideal inbox organizer to keep everything in place. You can keep papers, files, and magazines in order while also having a place for pens and pencils and other small items. CLASSIC DESIGN: There is no need for a basic, boring office supplies organizer; you need something to match your style and decor. This antique gold desk set is perfect, with its gold finish and unique diamond pattern. SIMPLE STORAGE: If you need desk organization, this is the set for you. It's a desk storage set that will put you on the path to organization. Whether you need office organization, a dorm room organizer, a writing desk organizer, or simply need to keep things together, this is the set for you. 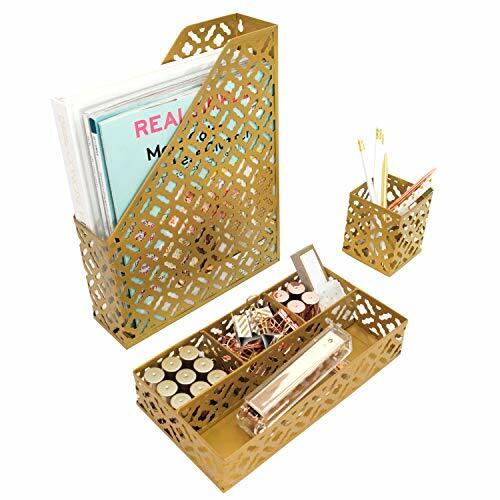 STAY ORGANIZED: Looking for a small desk organizer caddy? A computer desk cubicle organizer is the best way to keep everything in order and keep important files together. You can easily store everything you need! Makes a great gift for Christmas, Back to School, Co-Workers, Students, Teachers, Birthdays, and more! Perfect for your home, office, kitchen, cubicle, Dorm or any room! If you have any questions about this product by Blu Monaco, contact us by completing and submitting the form below. If you are looking for a specif part number, please include it with your message.